Cloudy this morning with showers during the afternoon. High around 65F. Winds WSW at 10 to 20 mph. Chance of rain 50%..
Cloudy with showers. Low 42F. Winds WSW at 10 to 20 mph. Chance of rain 60%. The Ladies Club 2nd Annual Old Fashioned Easter Day event is coming up on Easter Sunday, April 21 at 2 p.m. at Cedar Springs Missionary Baptist Church headed up by Pastor James Wright. The Church located at 126 Cedar Hill Street in Cedartown will feature an opportunity for an egg hunt with American Legion Post 524 for younger children, a musical performance, refreshments and more. An Easter Sunrise service is coming to Peek Park on Sunday morning, April 21 at 7 a.m. at the Pavilion on the Jule Peek Avenue side of the park. This year Dr. J. Marcus Merritt from Cedartown First Baptist Church will be providing the message. All are invited and encouraged to attend. Polk County is invited to take part in Holy Week events at several churches around Rockmart and Aragon coming up ahead of the Easter holiday, starting on Monday, April 15 and continuing through Easter Sunday on April 21. That includes a Monday worship service at Rockmart First Methodist on April 15 with First Baptist Pastor Jason Odom leading the service, on Tuesday, April 16 at Rockmart Presbyterian Church with Rockmart First Methodist’s Rev. Martha Dye leading the service, on Wednesday, April 17 at Aragon First United Methodist Church featuring Earl Johnson, and Thursday, April 18 at Morning Star Baptist with Jaye Sawyer leading worship. On Friday, April 19, Rockmart First Baptist is hosting services with James Hannah, and then a sunrise Easter Service on April 21 will be led by Maryellen Hittel at Rockmart Presbyterian Church. Editor’s note: the location on Thursday has been updated to reflect an error on our part. Please make note of it for those planning to attend Holy Week events. Free Notary Training is coming up on Wednesday, May 15, 2019 in a session from 10 a.m. to 11:30 a.m. or 1 p.m. to 2 p.m. at the Polk County Courthouse with officials from Polk County Superior Court Clerk Stacie Baines office. Those who are interested are asked to RSVP to the clerks office no later than May 14, 2019 at 3 p.m. by calling 770-749-2114. They cover the training for prospective and current notaries. All are welcome. The Rockmart History Museum on South Marble Street in downtown Rockmart is open Tuesday through Friday, 10 a.m. until 4 p.m. and on Saturday 11 a.m. until 3 p.m. The Museum welcomes visitors and group tours. Contact Pat Sampson at 678-764-5201 for information. RHM meetings are held on the first Wednesday of each month and volunteers are welcome and encouraged to take part. The Polk County Democratic Committee Meets on the second Saturday of every month at 9:30 a.m. In the “even” months (February, April, June, August, etc.) the organization meets at The Rockmart Library at 316 N. Piedmont Ave., Rockmart and during the “odd” months (January, March, etc.) they meet at the Cedartown Welcome Center, 609 Main St., Cedartown, GA 30125. The American Legion in Rockmart is hosting their monthly all-you-can-eat spaghetti dinner coming this Wednesday, April 17. Meal of spaghetti, meatballs, garlic toast and salad, $5. They hold dinners on the third Wednesday of every month. Join the group for a good meal and to support veteran and children’s programs. The Legion is located at 1 Veterans Circle, Rockmart. 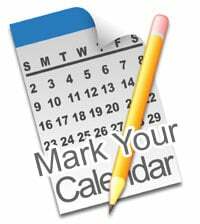 Check back for an updated date in the coming edition of the Standard Journal’s Calendar of Events. Lutheran Services of Georgia’s Heritage Adoption Program partners with DFCS to find Forever Families for children waiting in Georgia’s foster care system. Information Sessions are held on the third Thursday of every month at 6 p.m. at the Rome Office, located at 336 Broad St., Suite 200. Individual sessions may be scheduled to accommodate families as needed. For more email aweaver@lsga.org or call 706-506-0649. Victory Baptist Church’s Bread of Life Food Pantry is now open. One bag of non-perishable food, five items to pick from produce, eggs and milk and two items from frozen meats, breads and others will be available. ID is required. Limit of two IDs per address. Regular hours are Mondays, 1 to 3 p.m.; Tuesdays, 5 to 7 p.m.; and Thursdays, 8 to 10 a.m. The Georgia Legal Services Program’s Claire Sherburne will be on hand at One Door Polk in Cedartown every fourth Monday to help those in need with free civil legal services to low-income persons. This will include all cases related to housing, employment, education, domestic violence, consumer fraud, wills, healthcare and other issues involved in the legal complications of everyday life. Call 404-206-5175 for more information. The Polk County Alzheimer’s Caregiver Support group will meet monthly on the first Monday at 11 a.m. at Polk Medical Center. Those interested can join for fellowship and lunch in the cafeteria. For more information call John Giglio at 678-246-8188. The Rev. Gilbert Richardson and the Ware’s Grove Church family of 200 Potash Road, invite everyone to join the Impact Service held each Sunday at 9:45 a.m., followed by regular worship services at 11:15 a.m. Bible class is held Wednesday nights at 7 p.m.
Rockmart First United Methodist Church invites the community to come out and join in worship on Sundays and Wednesdays at the church located at 135 W. Church St. Sunday morning worship begins with Bible study at 9:45 a.m., followed by Sunday school at 10 a.m. for all ages, and an 11 a.m. worship service. Wednesday night includes at 5 p.m. community meal on the last Wednesday of every month, 6 p.m. Bible study and choir practice at 7 p.m. Weekly children’s events at the church include a 5:45 p.m. children and youth meal, 6:15 Children’s music and MYF, followed by L.I.F.E. at 6:54 p.m. All are invited to join in. Call Rev. Martha Dye at 770-684-6251or email marthadye@ngumc.net for more information or questions. The church also updates weekly on their website at rockmartumc.org. The Cedartown Optimist Club meets on Thursday mornings at 7 a.m. for their weekly breakfast meeting and encourages members to join in and take part at the Goodyear Civic Center on Prior Street in Cedartown. Those interested in joining the Optimist Club and help local youth organizations can contact Ronnie Dingler by e-mail at nmvideo@bellsouth.net. The Polk County Beekeepers are now meeting the second Thursday of each month at the Polk County College and Career Academy’s Cedartown High campus in the community room at 7 p.m. Whether you are an experienced beekeeper, new beekeeper or want to learn all are welcome. For details email polkcountybeekeepers@gmail.com or visit polkbees.com for more information. The RCAC’s first ever juried art show with a variety of mediums continues through Friday, March 22 at the Rockmart Art Gallery, located at 316 N. Piedmont Ave, Building 300. It continues through March 22. Regulary gallery hours are Wednesday through Saturday from 10 a.m. to 4 p.m. Call 770-684-2707 for more information. The Rockmart Cultural Arts Center is offering a Pottery Camp on June 17-21, 2019 for ages 8-12 taught by Paul Craighead and an Art Camp on July 8-12, 2019 for ages 7-12 taught by Margaret Bearden and PeggyCline at the Arts Center. The Rockmart Theatre is offering 2 theatre camps this summer: Theatre Camp I: “The Aristocats, Kids” on June 5-14, 2019 for students who have completed K – 5th grades and Theatre Camp II: “Honk, Jr.” on June 17 – 28, 2019 for ages 12 – 18, both directed by Margaret Jacobs. The Sit and Stitch is back to sewing at Rockmart First United Methodist Church in the fellowship hall. The group will meet the first and third Monday’s of each month from 10 a.m. to 2 p.m. Participants can bring any craft they choose or help with a ministry project this year. The group is making crochet or knitted caps for donation to Helping Hands. A pattern will be provided and the group has crafters who can help those in need of instruction. Bring a sack lunch. Coffee or tea provided. Any questions please call Madeline Brown 678-435-5032. Have a hidden singing talent, or want to get back into a chorus? Lend your voice and take part in the Rockmart Community Chorus on Tuesdays at 7 p.m. The choir is preparing for it’s Spring and Christmas concerts. Contact Debbie Miller, director, about taking part by calling 404-219-9572 or debbiebmiller@aol.com. The Rockmart Cultural Arts Center’s winter Children’s Classes hosted by Margaret Bearden include monthly classes for children 3 to 6 years old on the second Wednesday of each month from 10 to 11 a.m. ($15 per child per class.) Bearden hosts Drawing and Painting classes for students seven to 12 years old on Mondays from 5 to 6:30 p.m. ($60 for 6 classes paid at first class, or $15 per.) Classes are also available on Thursdays from 10 to 11:30 a.m. for students 7 to 12 for Home School Mixed Media ($60 for 6 classes on first class, or $15 per) and Paint Parties are available as well. Contact Bearden at 770-500-4207 or by email at margaretbearden@gmail.com. Pottery by Paul Craighead continues through the winter season at the RCAC, which includes Beginning Hand building on Tuesdays from 6:30 to 8:30 p.m. Prices are $145 for 8 weeks. He also hosts an Open Studio for more advanced potters Wednesdays from 10 a.m. to 11:30 a.m. and 6:30 to 8:30 p.m., and Thursdays from 10 to 11:30 a.m. $15 per class. 16 and up for all classes, but Age 8 and up if accompanied with a parent or approved by Craighead. Contact him at 770-843-5302 or by e-mail at rivoletti@netzero.net. Take part in a bi-monthly class for adults influed in arts and self-empowerment, HeARTS and SOUL at the RCAC. $20 per person, includes all supplies. Dates and times to be announced. Contact Donna Duff at 770-855-7767 or by email at ctwarts@gmail.com. The RCAC is hosting Now and Then of Rockmart to provide students with help gaining an eye for seasonal and home decor. Classes are being planned for Thursday nights and Saturday mornings, but dates are to be determined based on interest. Contact Tina Lanier at 678-883-9300 or by email at thenandnowofrockmart@gmail.com. Piano lessons are available from Madelyn Stringer through the RCAC on Mondays from 10 a.m. to 6 p.m. and Wednesdays 1 to 5 p.m. Ages 6 to adult, all skill levels. $15 per weekly half hour private session, or $25 for an hour. Contact Stringer at 678-988-4133 or by email at madelynaudrey2000@gmail.com. Carla Redding is providing a variety of photography classes this winter at the RCAC, ranging from getting to know a camera and how to take good photos, to using professional level software like Lightroom and Photoshop CC. Additional outings are available as well. Contact Redding for prices and schedules at — 770-546-3943 or ctr7510@aol.com. Beginning Yoga can help people gain greater flexibility and stregth while maintaining graceful movements. Learn from Ramona Camp for $12 for an hour long class on Tuesdays from 9 to 10 a.m. or Thursdays 6 to 7 p.m. Age 12 to adult, but those under 18 must be accompanied by a parent. Bring a mat, pillow, water bottle and wear comfortable clothing and get ready to stretch out at the RCAC! Contact Camp at 706-621-2306 or ramonacamp7@gmail.com to sign up!